Their morphology is sometimes likened to an upturned boat and they are characteristically steepest at the upwind end and taper downwind. They are found in a wide range of rock types, however on Earth they are well expressed in poorly lithified but cohesive materials such as lacustrine and volcanic sediments. 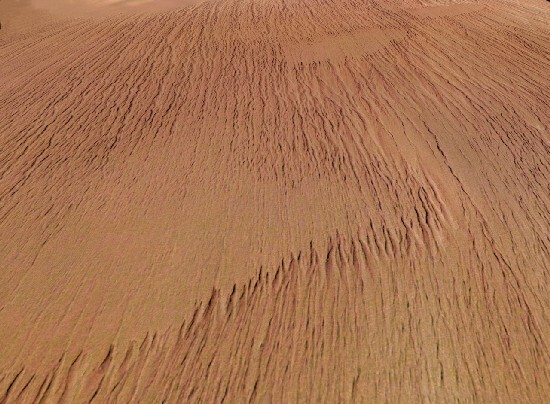 Yardangs have been identified on Mars since the late 1970’s (Ward, 1979). These features are important for interpreting both Martian climatic history (through data on wind velocity and direction) and regolith properties and processes (through data on wind erosion and substrate erodability). Image 2: Part of HiRISE false-colour image PSP_007417_1755 of meso-yardangs in Tithonium Chasma. Yardangs have not been previously described from Australia, other than the micro-yardangs at Gurra Gurra Waterhole in the Strzelecki Desert reported by Mark Bishop (2001). In addition, well developed meso-yardangs are found in areas where cohesive but poorly indurated sediments, such as lunette deposits are eroded. 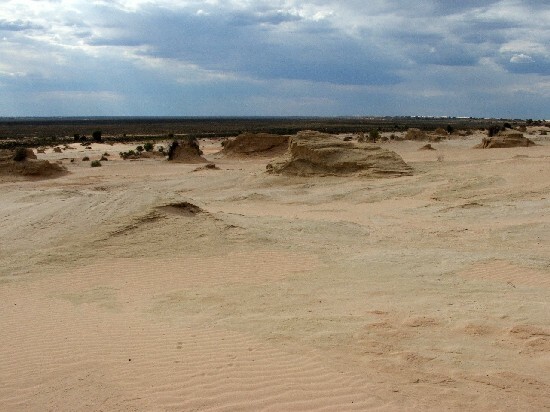 Particularly well developed but previously unreported examples occur on the Lake Mungo lunette in New South Wales, an area better known for its archaeological and Quaternary significance (Bowler et al. 2003) than as a Mars analogue. The recognition of these features extends the known distribution of yardangs in Australia and provides an additional Mars analogue for local researchers. Image 3: Upwind view of the Lake Mungo lunette yardangs with the vegetated bed of Lake Mungo visible in the distance. Runoff-deepened troughs between the yardangs have been partly filled by pink, wind-rippled sand. 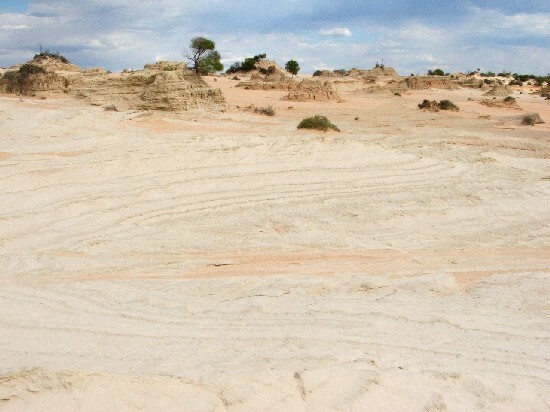 Image 4: Yardangs of Lake Mungo lunette. Well-bedded aeolian sediments with primary dip make up the substrate and makes an interesting comparison with substrate bedding in Image 2. 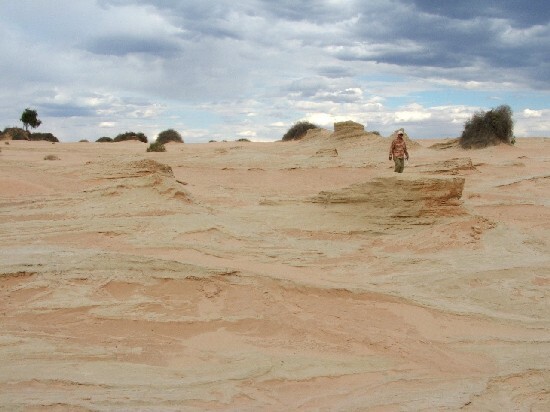 The Mungo yardangs are between 0.5 and 2 m high and 2 and 10 m long. Together they comprise the feature known locally as “The Walls of China”. They are eroded into multicoloured clays sands, and sandy clays of Pleistocene age that comprise the Mungo lunette. Their heads point west-southwest, into the prevailing wind. Some yardangs preserve remnant vegetation at their heads, suggesting that erosion was first initiated between binding vegetation. Active wind ripples between the yardangs and large dunes on the downwind side of the lunette show that the yardangs are actively forming. The troughs between the yardangs are locally deepened by runoff to form gullies. Image 5: Side-on view of small yardangs and intervening wind-scoured surfaces with pink aeolian ripples on the Lake Mungo lunette. Fenton, L. (2008) Yardangs on Earth and Mars. IAG Planetary Geomorphology Working Group Featured Image, Sept. 2008.